11 a.m. July 6, 2016 - Motorists traveling through Maple Grove to and from Rogers have an added obstacle of a downed power line following a July 5 storm in the Twin Cities. Rogers Police Chief Jeff Beahen issued a statement the morning of Tuesday, July 6, asking motorists "not to attempt to to drive on roads through south side of the city [of Rogers]." 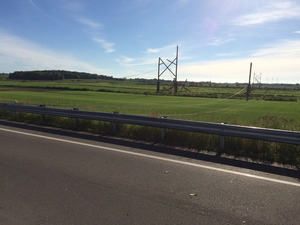 The July 5 storm knocked down a high voltage power line, "effectively creating an east-west barrier that cuts Rogers, Hanover, St. Michael and surrounding cities off from metro cities to the south," according to a release from Hennepin County. Travelers are urged to use I-94 until the alternate roads are reopened. "Repairs could take several days, Beahen said. Out-of-state crews will be arriving to remove the downed lines from the roadway.